In total there are 77 polling stations in Tawang district out of which 05 will be all women polling station. 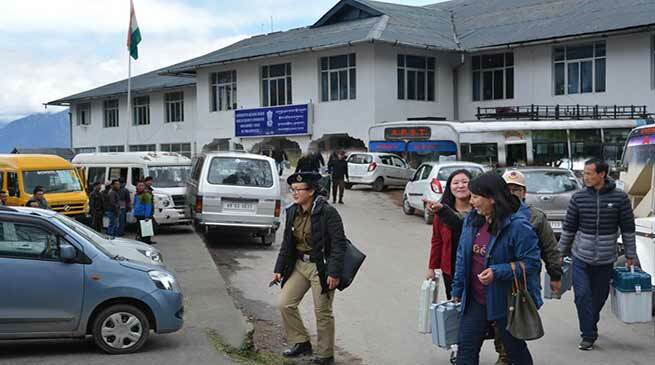 The polling teams of Tawang district has moved out of district headquarters today on 10th of April 2019 for their respective polling stations. The polling team for few remote polling stations like Luguthang, Mago, which are to be covered on foot moved out on 8th April. SP Tawang SS Kalsi has confirmed that polling team to these remote polling stations has reached at their respective polling stations and HF stations for communication has been successfully installed. In total there are 77 polling stations in Tawang district out of which 05 will be all women polling station. 01(one) each in Lumla and Mukto and 03(three) in Tawang this election. After the polling is over all the polling team will report back to headquarters on the same day except for few polling stations which are partially motorable or to be covered on foot.